The quick version: we only collect the (your) personal data that we need in order to supply you with the products you’ve ordered, deliver them to the address you’ve stipulated, and be able to contact you in the unlikely event of a problem with the product. We don’t sell your personal data, and we don’t do Big Data. Simples. For some transactions, we may share your information with credit reference agencies and other companies for use in credit decisions, for fraud prevention and to pursue debtors. We also occasionally use Google Analytics, when we’re not busy cooking, so that’s not that often. But you can opt out of that too – see Section 1/10 below. 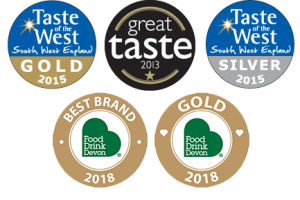 Where we would like to send you information about our own products and services, such as new products, newsletters, recipes, feedback or competitions, we would do this by post or more likely email, and we’ll ask you to opt in. We’ll make it clear, and we’ll make it simple(s). We won’t bombard you; we don’t like that either. If you agree to us contacting you in this way, just tick the relevant boxes. If you choose not to, we won’t take it personally. Otter Vale Products Ltd. (“us”, “we”, “Otter Vale”, “the Company”, “the Business” or “our”) operates the https://www.otter-vale.co.uk/ website (the “Service”). An agreement giving rise to obligations which are enforced or recognised by law; effectively the User using our Service/Website and placing an order with us. Data Processor (or Service Provider) means any person (other than an employee of the Data Controller) who processes the data on behalf of the Data Controller. We may use the services of various Service Providers in order to process your data more effectively, in compliance with GDPR legislation. We may use your Personal Data to contact you with newsletters, marketing or promotional materials and other information that may be of interest to you; or in the event of a product recall. You may opt out of receiving any, or all, of these communications from us by following the unsubscribe link or instructions provided in any email we send or by contacting us. Otter Vale will also retain Usage Data for internal analysis purposes. Usage Data is generally retained for a shorter period of time, except when this data is used to strengthen the security or to improve the functionality of our Service, or we are legally obligated to retain this data for longer time periods. Your information, including Personal Data, may be transferred to — and maintained on — computers located outside of your county, state, province, country or other governmental jurisdiction where the data protection laws may differ than those from your jurisdiction. Under certain circumstances, Otter Vale may be required to disclose your Personal Data if required to do so by law or in response to valid requests by public authorities (e.g. a court or a government agency). Otter Vale aims to take reasonable steps to allow you to correct, amend, delete, or limit the use of your Personal Data. You have the right to data portability for the information you provide to Otter Vale. You can request to obtain a copy of your Personal Data in a commonly used electronic format so that you can manage and move it.